Boston is one of those wonderful places where there are so many things to do you’ll need to plan your itinerary carefully, especially if your stay is short. Perhaps the best place to start is at the Skywalk Observatory at the Prudential Center, Boston’s only sky-high vantage point for sweeping 360 degree views of Greater Boston and beyond. On a clear day, you can see up to 100 miles away, and a bird’s eye view of Boston’s Hancock Tower, Fenway Park (home ground of the Boston Redsox baseball team, for those of you not in the know), the Boston Common, boats sailing or rowing far below in the Charles River, the historic Faneuil Hall Marketplace, world-renowned academic institutions MIT and Harvard University, just a few of the betterknown Boston landmarks. The observatory’s Dreams of Freedom Immigration Museum explores Boston’s immigration experience, the multi-cultural mix that gives the city its vibrancy. WASP and Irish Catholic, Italian and African, and many others came here to make the city one of the most multi-cultural in America. The Top of the Hub beside the observatory is one of Boston’s most elegant restaurants, a great venue for a special occasion dinner, with panoramic views of twinkling harbour lights and planes landing at the airport. Just across from the airport at Fan Wharf preparations were being made for the arrival of the Volvo Ocean race around 27 April — Boston is the race’s only North American stop, fittingly for a city obsessed with boats, fish and the sea. A lively schedule of events, a mixture of Boston and Irish talents, are planned for the festival before the boats depart for Galway on May 16. This presents the city with the ideal opportunity to show off its 38 mile HarborWalk, designed to bring people back to the waterfront to walk, run or ride their bikes. The Volvo boats will scarcely have left port when the city throws another big festival for Tall Ships Atlantic Challenge participants, who stop by in July on their way to Halifax and then Belfast. A tourist could spend an entire holiday just looking at the Irish connections in Boston. The ghosts of the Kennedys hang over the city as well as neighbouring Cape Cod. For something off the beaten track, visit the birthplace of John F Kennedy, a surprisingly modest middle class home. Bought back by the Kennedy family to create a museum to the president’s early life, Rose Kennedy’s commentaries in her rasping high pitched Boston drawl bring the place to life, and guide Mark Schwartz emphasises the early formal training in debating for the Kennedy scions in family dining room, which includes a toddlers’ table set with silver porringers engraved with the names of the two oldest sons, Joseph and JFK. But most people will opt to see the flamboyant John F Kennedy presidential library and museum, an iconic building on the shoreline at Colombia Point. A series of film clips and exhibitions pay tribute to different aspects of the Kennedys’ lives during the presidency. Jackie’s dresses and seating plans for White House dinners are among the highlights. The museum also has a terrific website at www.jfk.org — view the daily White House diary complete with clips of presidential tv appearances. Across the Charles River in Cambridge get a free guided tour of Harvard, educator of the intellectual elite of the US east coast — both Obamas are graduates of Harvard Law School. Local bar the Plough and the Stars is a lively spot, an odd dichotomy of the intellectual and the quare stuff, an intriguing mixture in this case. Small with live bands and, being close to Harvard, an interesting clientele which often includes the odd Nobel prizewinner. Matthew Pearl’s novel The Dante Club, published in 2003, offers intriguing insights into the lives of Bostonians and Harvard academia in the 19th century. The city looks entirely different after you have read this whodunnit about American poet Henry Wadsworth Longfellow and his circle. Longfellow’s carefully preserved house in Cambridge is well worth a visit –it also served as headquarters for General George Washington during the Siege of Boston, 1775 – 1776. It has many Irish connections, including a rather risque little inkwell once owned by Thomas Moore. Like most greater Boston venues it is easily accessible by public transport — locals advise you not to hire a car until you are travelling well out of town, as parking costs are high. No visit to Boston would be complete without a visit to Faneuil Hall, where Samuel Adams rallied the citizens of Boston to the cause of independence. Later, in the 19th century, Frederick Douglass and other abolitionists attracted large audiences to the hall in their fight against slavery. 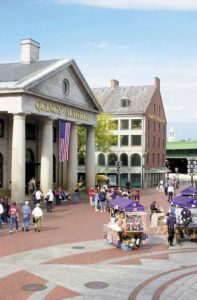 Today Faneuil Hall and its environs provide an attractive cobblestoned venue for tourists, with performance artists, shops and the renowned Quincy Market with its myriad of ethnic food stalls. Chose from lobster sandwiches, New England clam chowder, Chinese, Japanese, Italian food, you name it, it is here. The North End was home to Paul Revere, whose famous midnight ride on 18 April 1775 from Boston to Lexington to warn John Hancock and Samuel Adams that the British Army were on their tail made him an icon. Revere’s modest wooden house built in 1680, has been carefully restored, a typically thoughtful act in a city that obviously treasures its history. n The Freedom Trail, a 2.5-mile walk that passes 16 significant historic sites; begins at Boston Common and ends at Bunker Hill, near the Charlestown Navy Yard. n Shopping – tax free under $175; the upscale boutiques of Newbury Street, Copley Place, and the Prudential Center in the Back Bay; Faneuil Hall Marketplace; across the Charles River, there’s Harvard Square; farther out, the Kittery Outlets and Wrentham Village Premium Outlets, and the Natick Collection. n Two lively pubs –the Plough and the Stars in Cambridge: you can never be quite sure what is going to happen next. And Hurricane O’Reillys, a great match venue near TD Banknorth Garden, home of the NHL’s Boston Bruins and NBA’s Boston Celtics. Ida Milne flew to Boston with Aer Lingus. The airline operates daily direct flights between Dublin and Boston and between Shannon and Boston. Aer Lingus also offer daily flights between Cork and Boston via Dublin, in conjunction with Aer Arann. See www.aerlingus .com for further details. Intending visitors to Boston should see www.bostonusa.com, a comprehensive and lively site full of useful suggestions. Quite the best cityguide website we have seen.